Drama, Puppet, and Storytelling Lessons, Ideas, Activities, and Resources for Teaching The Anointing of David in Sunday School. Post your Drama, Puppet, and Storytelling lessons, ideas, activities, and resources for teaching the Anointing of David in Sunday School. 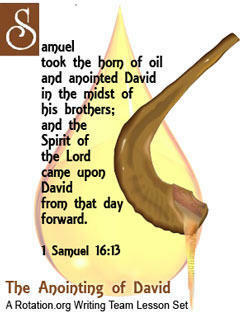 Anointing of David, 1 Samuel 16, etc. teaching with Drama, puppets, scripts, skits, acting, newsroom, etc. Be sure to see our Writing Team's "Anointing of David" lesson set. It has creative Drama, Puppet, and Storytelling lesson plans in it. Everyone can see the lesson summaries and Bible Background for that special set. In this workshop, the learners use “object theater” to act out the story. Object theater is a special type of puppet theater where everyday objects are used instead of puppets to represent characters. Read over the background material included in your teacher packet as you become familiar with the Bible story and the lesson plan. Place all the objects out in the floor on the table in the blue room. Keep in mind that this is a fun play—if it isn’t polished, that’s ok.
Greet the children and introduce yourself. Remember that you are interacting with a different group of students each week—some may not know you. Wear your nametag and make sure that the children are wearing theirs. Do any of you have brothers and/or sisters (or cousins)? Are they older or younger? How does the oldest treat the youngest in your family? If you are playing a game and need a team leader, would you pick the youngest or the oldest? What would you think if someone else picked the youngest to lead a team? 2. Introduce the story for today by telling the class that Samuel was a prophet who shared God’s word with God’s people, and that Saul was the king of Israel at the time of the story. God was not satisfied with the work Saul was doing. God tells Samuel to choose another king, and gives Samuel an answer for the danger in which God places him. Jesse comes with his sons for the sacrifice. Samuel looks at all of Jesse’s sons, and deems each of them worthy. However, none is the correct one. Samuel insists on seeing the youngest son, so Jesse sends for him. David is anointed as the new king. David—young, tends sheep, writes songs. 5. Tell the class that today we will recreate the story using an odd assortment of items as puppets. Ask for four volunteers for the play: one will be the narrator that reads the story, one will be the voice of God, and two will be “puppeteers,” moving the objects around in the play (one for Samuel and one for the others.) The rest of the class gets to watch the production. Line up in order of height. Which people in the class do you think would be the best basketball players? Why? How do those of you at the shorter end of the line feel about this assumption? Think about this when the youngest brother is chosen. Think about how the first 7 brothers felt when they were passed over. Show how each might have looked when they were passed over. Show how each might have looked when David was chosen. Show how David might have looked when he was chosen and oil was poured on his head by Samuel. 7. In the blue room with the volunteers, give the narrator a script. Let him or her read through it silently. Give the voice of God a script to go over and the poster board to hold up when God speaks God’s refrain. After the first time the line is spoken by God, the actor should hold up the board and encourage the audience to say the line with God. Give the two puppeteers time to choose objects for the other characters—Samuel, Jesse, and the eight sons. Tell them to make choices that might fit the physical characteristics of the characters, especially each of the sons. 8. When the volunteers are ready, have them go into the drama room. The narrator can stand beside the table while the puppeteers go behind the table with their object characters. God can stand on the other side of the table, visible to the audience. Perform the drama for the audience. 9. If there is time when the performance is done, talk a little about the play and the choices that the puppeteers made for the characters. Let the audience tell why a certain object might have been chosen for a character, or let the puppeteer explain why that choice was made. All: how majestic is your name in all the earth! Leader: You have set your glory above the heavens. All: to silence the enemy and the avenger. All: what are human beings that you are mindful of them, mortals that you care for them? All: and crowned them with glory and honor. All: whatever passes along the paths of the seas. What do you think God could see special about a little boy like David? www.rotation.org writing team lesson “David: God’s Chosen King” Drama Workshop. Wehrheim, Carol A., editor, The Storyteller Series: The Shepherd King, Age-Level Leaders’ Guide, 1997, Christian Board of Publication, St. Louis, MO. Copyright (c) 1992 by American Bible Society. Used by Permission. [Samuel appears.] Good morning. My name is Samuel. I am a judge, a prophet, and a priest, called by God. I could tell you many stories -- about Saul, the first King of Israel; about his son Jonathan; about a giant named Goliath; and about a great king named David. I don't have time to tell all the stories today, but I do want to tell you a story about David. Did you know that he was not always a great king? It all started like this . . .
God was unhappy with the way Saul, chosen by the people of Israel to be their first king, was behaving. He was not following God's way. One day, God talked to me about it. I was told that God had already chosen a new king and I was to go anoint this new king. I argued with God for awhile, because that’s pretty dangerous! We already had a king, and I was afraid he would kill me if he knew I was going to anoint a new one. But God told me to go on, plan a sacrifice as a cover-up, and anoint this new king—a son of Jesse of Bethlehem. So, I packed my bag and was off to Bethlehem for an anointing and a sacrifice to the Lord. The town leaders were a bit concerned when I showed up, but I told them it was a peaceful visit. Everyone got cleaned up and gathered for the sacrifice, including Jesse and his seven sons. Such handsome young men! But which one was to be king? I trusted that God would tell me which to choose. Well, I could tell it wouldn't be a problem finding a king in this crowd of fine young men! I started with Eliab, the oldest. This first son of Jesse is such a fine young man. Since he is the eldest and has an important role in this fine family, I was sure this was the chosen one. Well, my job was done. I made the sacrifice to the Lord and returned home alone, but with this secret. I could see the spirit of the Lord was with David. David would be okay there in Bethlehem until it was time for him to serve God and God’s people as king of Israel. Have the kid sit in a circle, each holding one of the objects. Use the objects to tell the story, having each kid hold theirs up as you tell their part of the story (you'll have to prompt them). After telling the story this way once, do it again, seeing if they can remember their parts. Finally, ask them to tell you the story, calling on different ones, asking "..and then what happened?". A lesson written by Jan Marshall from: Brenthaven Cumberland Pres. The class will make a movie of the Lord choosing David to be King. God has a plan and is in control. God sees and understands things we do not. God sees our hearts and not our outward appearance. God chooses unlikely people to do God’s work. The class will learn about how David, a shepherd boy, was chosen to be king of Israel by listening to and acting out 1 Samuel 16:1-13. The children will understand that God sees and understands things that we don’t know and that God has a plan for us. olive oil flask, back pack, “offering” to God, crown, stuffed sheep if available. Greet the children and introduce yourself. Wear your name-tag. Explain the purpose of this workshop. How many of you are the youngest child in your family? (Accept answers) Great! Today we are going to learn about David who was the youngest of eight boys. Even though he was the youngest he was still chosen to be king of Israel because God knew David’s heart was good and pure. Review the Bible story 1 Samuel 16:1-13. Read the passage aloud to the children or let them take turns reading (for older grades). I wonder why God chose David to be a king even though David was the youngest? David has good qualities that will make him a good king such as patience, love of God, fairness, intelligence etc. How do you think David’s brothers felt? Surprised, jealous, glad to have a king in the family, annoyed because now they can’t pick on him any more. Has God ever chose you to do his work? Examples of doing God’s work-helping others etc. Actors needed: Lord (can be workshop leader), Samuel, town leaders, Jesse. Sons/daughters pick 8 (more or less is appropriate). Don’t assign sons/daughters names or designate one as David, instead give them sealed envelopes; inside the envelope have a son’s or daughter’s name and a brief description of them. For example: “My name is Shammah and I am honest/shy/hardworking etc. I enjoy working with my hands and I am especially good at building. My favorite food is olives.” (See suggestions at the end of lesson plan.) Include a description of David in one envelope. When selecting parts give each son/daughter an envelope but tell them not to open it until it is time to do that in the play. Make sure to give David’s envelope to one child even if all the son/daughter envelopes are not distributed. Everyone can have a part in the play adjust numbers as necessary. Props: olive oil flask, “offering” to God, back pack, crown, stuffed sheep if available. Older children can act and read lines, for the younger ones or non-readers “God” (the workshop leader) can act as a narrator to cue the action and words from the actors. Before taping practice the play at least once (don’t open the envelopes during practice though, save that for the real thing) and then film. Another option: You may choose to go outside for the play either with or without taping it. A shepherd or youth helper can be the camera person after all is set up. The shepherd can also eject the tape and get it ready to view in the TV/VCR. Why do you think I didn’t assign David’s or Jesse’s children specific parts but left it as a surprise? (accept answers) Good answers, one reason is to show how we don’t always know God’s plan in advance. We can’t control everything that happens to us. God’s plans for us may come suddenly or as a surprise. God chooses unlikely people to do God’s work. After the children write their cards shuffle them, pull one out and read it. Everyone will try to guess who wrote the card. Make sure shepherds and workshop leaders have also made a card. Thank all the children for sharing those special things about themselves. Tell them that God knows each one of us inside and out and has a special plan for our lives. Narrator: The Lord was in a bad mood, he was sorry that he had made Saul a King. Lord (looking grumpy): Samuel, I don’t think Saul should be king anymore. He is not doing a good job. Don’t worry about it though. Pack up your olive oil and go visit Jesse. One of his sons will be a good king. Samuel: But God, if King Saul finds out he’ll be really mad and put me in jail! Lord: Don’t worry. Take a calf with you and tell everyone you are going to make a sacrifice then invite Jesse to the sacrifice. When Jesse comes with his sons I’ll tell you which son will be king and you pour the olive oil on his head. See, isn’t that easy! Narrator: Samuel packs his back pack with olive oil and an offering and walks to Bethlehem. When he gets to Bethlehem, he sees the town leaders and they wonder if he has come to cause trouble. Town leaders: Hey Samuel, are you here as a friend or as an enemy? Samuel: I’m here as a friend. In fact, I’ve come to make a sacrifice to our Lord. You are invited to come. Oh, here comes Jesse, he is invited too. Hi Jesse, come to the sacrifice and bring your children too. Narrator: Samuel sets up the sacrifice by preparing the sacrificial animal, cross and olive oil. Jesse walks up with some of his children, the other half are left behind. Jesse: Hi Samuel, thanks for inviting me to the sacrifice. These are my oldest children (points to children). Kids, meet Samuel, an old friend of mine. Samuel: Look at that child (points to the tallest child), he is the tallest so he must be the one God picked to be King. Lord: I wouldn’t pick someone to be king just because they are tall. Samuel: How about this one, (points to another child) he is so handsome or this one who has a nice haircut? Lord: Being handsome won’t make you a good king or a good person. People judge others by what they look like but I’m God and I judge people by what is in their hearts. Samuel: Do you have any other children that could come? Narrator: Some of Jesse’s children were in the field taking care of sheep. Every one waiting until they came. Samuel: So Jesse, these are all your children? Jesse: Yes, they are all here, even the youngest, little David the shepherd but we all know you wouldn’t pick him. Ha, ha. Lord: Like I said before, I choose people by what is in their hearts, not by what they look like or how old they are. Samuel: Let us find out who is the chosen one. Lord: I have chosen David to be the King! Narrator: Samuel pours olive oil on David’s head and then David felt God’s spirit with him. Lord: (places crown on David’s head) My spirit will be with you. Everyone together: Praise the Lord! Eliab: I am the oldest son of Jesse. I have always been the boss and when I get older I will inherit all my father’s land. I’m good at math and I especially like counting money. Oh, did I mention that I am considered very handsome! Abinadab: I’m the second oldest. I’m also quite good looking but I’m jealous of my brother because he gets all the attention and land because he is the oldest. Shammah: I’m the third oldest. I’m kind of shy. I like to read a lot, I’m good at drawing and I love animals. My favorite food is olives. I love to go to church with my family. David: I’m the youngest of eight boys. My chore is taking care of the sheep each day. I try to do a good job for my father because he has given me a big responsibility. I hope he is proud of me. When I take care of the sheep at night I like to look at constellations. Son #4: I’m right in the middle. To get attention I like to pick on my little brothers and fight with my older brothers. I am really very smart but sort of lazy. My favorite food is pita bread with honey. Son #5: I love to work as a messenger because I enjoy running to bring messages to different people. I don’t like sitting still. My favorite food is dates. I keep a handful in my pocket for quick energy. Son #6: I am studying to be a carpenter because I enjoy building and using my hands. I’m glad I don’t have David’s job taking care of the sheep. I used to have to watch the sheep before David was old enough to do it. Shepherd is the worst job! But I love David, he is a great kid. Son #7: No one ever pays attention to me because I’m not the youngest but not near one of the big kids. I don’t know what I want to be when I grow up. Maybe a farmer. A lesson posted by rotation.org member Catherine.